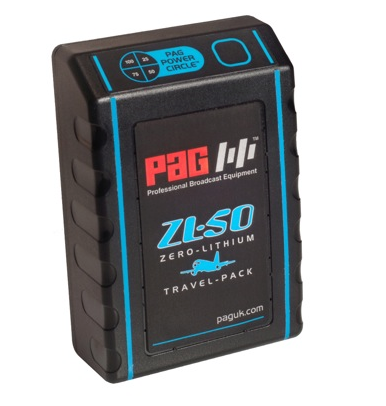 PAG ZL-Series batteries employ the latest Ni-MH cell-technology with improved cycle life. 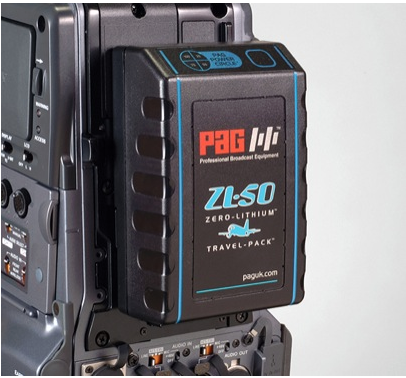 The PAG ZL-50 has a high-quality construction, a superior performance, and has been designed to maximise working life. The battery has a rated maximum continuous output of 7A. Zero-Lithium means flight-friendly batteries with no air transportation restrictions. A four LED array charge indicator is incorporated. Construction: High-impact polycarbonate injection mouldings designed to protect the cells from impact damage. The cells have welded interconnections of low-resistance nickel strap. Batteries are sealed and non user-serviceable. Cells: Premium grade Nickel-Metal Hydride sealed rechargeable cylindrical cells. Voltage: 14.4V Nominal (12 cells connected in series, nominal voltage 1.2V per cell). 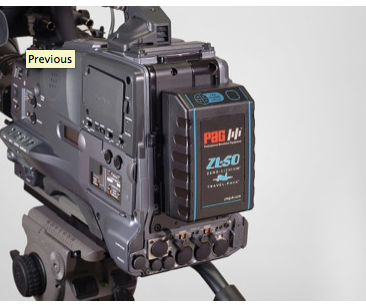 The battery is protected against short circuit and excessive currents by means of a self-resetting protection device. Rated maximum continuous output current is 7 Amperes. The battery is protected against over-temperature by means of a non-resetting thermal fuse rated 98°C. Operating Temperature Range:Optimum discharge efficiency is achieved within the temperature range 0°C to +40°C.